Jade asks Paul if he'll have dinner with her and her parents. He reluctantly agrees. Jade asks Paul if he and Hannah have really broken up. Jade asks Paul if he's lying to her. Paul tries to wriggle out of it but Jade isn't having any of it. She wants to know why Paul hasn't told Hannah that they are together. She asks Paul if he likes Hannah more than her. He says he doesn't. She wants him to ring Hannah and tell her. Paul is reluctant. Jade is very angry and says he's been stringing them both along. She storms out. Joel is researching mobile phones. Lou comes to the door and wants to do an inspection. They are frosty with him over the rent hike. Lou continues the inspection while they go shopping. Paul is telling Harold what happened with him and Jade. 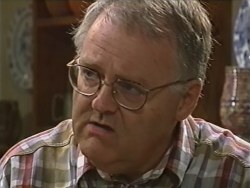 Harold says that Jade has good reason to be angry. Harold asks which girl he likes most. Paul doesn't know. Harold says if he doesn't make a decision, he'll end up with neither of them. 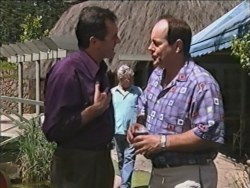 He tells Paul to sort it out before he goes to Port Lincoln with his dad. Joel is trying out his new mobile phone. They read Lou's report on the maintenance - he's ticked everything as excellent whereas they think everything is fair to good. He also wants them to pay the water bill and wants to discuss Bob with Sarah. Phil has had an email from Hannah - she is definitely coming home. Phil thinks she's changed and things will be fine when she comes home. Ruth reads an advert about the surgery that makes no mention of her at all. Ruth is cross that Karl is so petty and penny-pinching. Harold is horrified to see the librarian of the University Library come in - the one he had to return the dodgy book back. But the librarian is supportive of him and says that the library treated him in an over-strict way. She says it's nice to see an adult returning to study. Sarah and Joel come to discuss the water bill with Lou. He says that it's standard practice for the tenants to pick up the cost. He also says that he has noticed some scratched on the cupboards - Bob will have to stay outside from now on. Sarah is appalled. Ruth comes in and shows Karl the advert. She asks why they didn't take out an advert together. 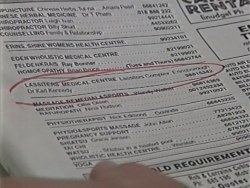 Karl says that Pippa writes the adverts. Ruth says Pippa is completely inefficient but Karl says Ruth has got it in for Pippa. Sarah hopes Toadie's plan to bring Lou down will work. Sarah says she can't put Bob outside - he'll be lonely and depressed. Joel suggests they change the plan of attack - appeal to Lou's good side. 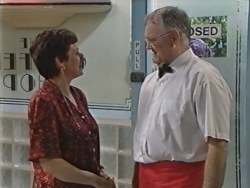 Karl tells Ruth about the alarm at the surgery. He asks Ruth if she'll pay to fix the door. Ruth says she's an equal part of the surgery when it comes to paying bills but not in anything else. Ruth says if she's not equal, Karl can pay for the alarm. Jade is blanking Paul. Joel asks him if he has girl troubles. Joel reckons that Harold is wrong - Paul has only been dating Jade casually and they aren't committed. He tells Paul not to burn his bridges - Hannah might not want to get back with him after being in France. 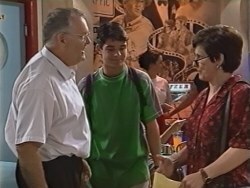 Phil asks Karl to join him and Ruth for lunch but he declines. 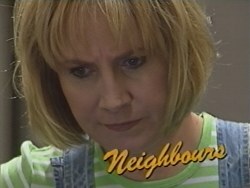 Ruth tells Phil that she tackled Karl about the alarm and the advert. Phil tells her to be careful but Ruth says that he's had his way for far too long and needs taking down a peg or two! The librarian comes into the Coffee Shop again. She shows Harold a book she has bought about gardening. Harold is very interested and the lady (Frances) offers to lend it to him when she's finished reading it. Harold says he might not have time while his wife is away. The librarian looks a bit disappointed at the mention of a wife. Paul asks Jade if they can talk later and she agrees as long as it's good news. Joel and Sarah have invited Lou to lunch. Joel is limping a bit and Lou is concerned. 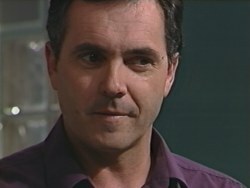 Paul tells Jade that he's written to Hannah. Jade says a phone call or email would have been better. But she is still pleased and kisses him goodbye, saying she'll see him when he gets back from Port Lincoln. Paul tells Harold that everything is under control. Lou thanks Sarah and Joel for the delicious lunch. Sarah argues with Lou about keeping Bob outside. Joel says he can't afford the water rates for the pool so he can build up his leg. Lou is unmoved though and leaves, thanking them for the lunch. Ruth reads an email from Hannah. It says that she's glad Ruth has "changed a lot since Broome". Ruth is not pleased and asks Phil what he's been saying to her.